Beñat Intxausti (Movistar) took his team’s third stage win today, outsprinting the Estonian champion Tanel Kangert (Astana) and Poland’s Przemyslaw Niemiec (Lampre Merida) to win Stage 16 at Ivrea. The Maglia Rosa, Vincenzo Nibali (Astana), responded to a series of attacks on the final climb and descent, but ended the stage having safely defended his overall race lead. The stage winner and the Maglia Rosa both spoke to the press after the stage. A complicated finish: "It wasn’t easy. In the final 3 kilometres, Kangert was on my wheel. I knew he was dangerous. 600 metres from the line, I cold-bloodedly moved behind Niemiec and Kangert into third place. 300 metres from the finish line, the pace slackened. With the wind behind us, I darted past on the left and gave it everything." 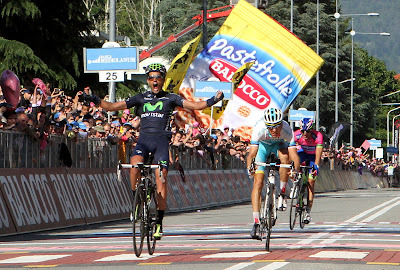 First, the Maglia Rosa, now, a stage win. "Above all, I came to the Giro with the goal of raising my hands at the end of a stage. The Maglia Rosa was very important for the team, although losing it during the time trial at Saltara left a strange taste in my mouth. Today I got my stage win." Ambitions for the mountain time trial? "I think the favourite is sitting next to me [Nibali]! It’s a speciality that suits me, although I know it isn’t easy to get repeat wins at the Giro. For the team, our three stage wins so far have been very important, and wearing the Maglia Rosa has made this an outstanding Giro for Movistar. 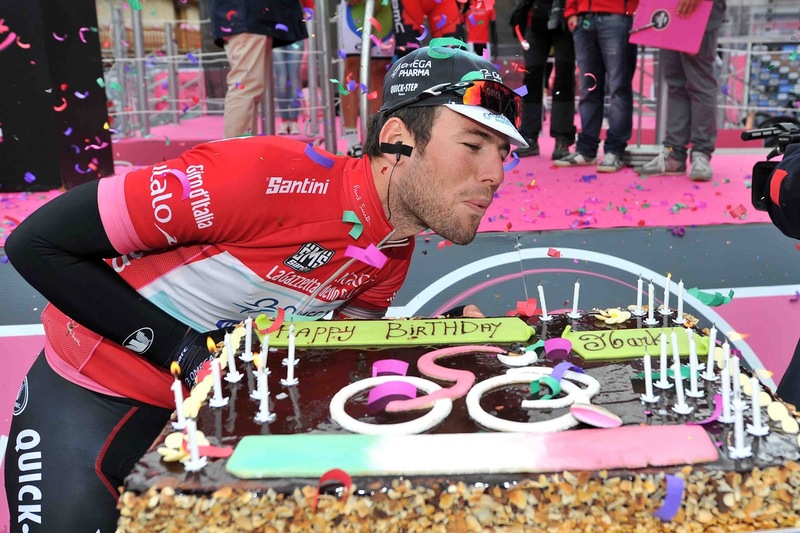 Now we have just a few more days to move up in the top ten of the General Classification." The final descent: "I accelerated where the road surface was good, to close the gap. On some corners, there were rivulets of water, and I didn’t like the conditions, so I didn’t take any risks. At one point, Scarponi missed a curve, so I rode quite carefully and just kept a watchful eye to make sure nothing happened." On Kangert’s performance: "2km from the finish, I told him to attack, to win the stage and neutralize the time bonuses. The team wants a stage win. He’s in good shape, and we’ll see whether he has a free role in the mountain time trial. He’s having a good race, and he’s always been beside me in the mountains." Scarponi on the attack: “Scarponi is a few minutes back (3m53s), so he has to look for opportunities in every stage to try to win back time. Cadel is much closer, and he will certainly try something in the mountains. But I want a stage win. The most important stages are Mori-Polsa, Val Martello, and Tre Cime, although I know it’s going to be very difficult." Scarponi's attacked on the final climb, the descent and flat to the finish but Nibali always chased him down. The attacks did hurt Santambrogio, Scarponi and Niemiec have now moved ahead of him on GC. "Today I tried to attack to test how my opponents would respond. Nibali still rules, I'm focusing my attention for a podium spot as a goal, the team is strong. Niemiec and I are a very competitive duo". Mark Cavendish, Maglia Rossa, celebrated his 28th birthday today. 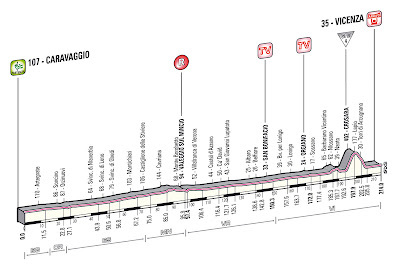 Tomorrow: 214 km from Caravaggio to Vicenza, home of Campagnolo. 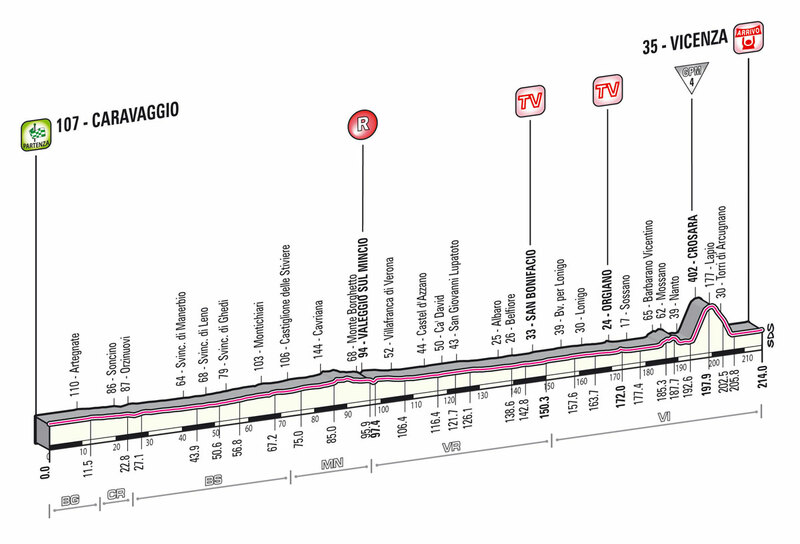 Flat stage until the 192nd km when riders arrive at the short Crosara climb of 5.3 km at 6.8 %, 12% max. A climb placed not unlike the Andrate climb of today.